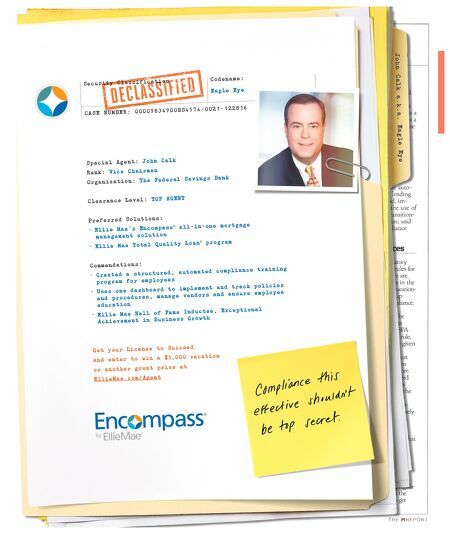 46 | TH E M R EP O RT O R I G I NAT I O N S E R V I C I N G DATA G O V E R N M E N T S E C O N DA R Y M A R K E T ORIGINATION THE LATEST Substantial Growth on the Origination Front First mortgage originations rose 9 percent over the year in 2016. F irst mortgage origina- tions stayed above 2 percent to close 2016, according to the latest Consumer Trends Report by Equifax. The total number of new loans originated was about 7 million, an increase of just below 9 percent from the same time period a year ago. The total balance of new loans in that same time was $1.69 tril - lion, an increase of 13.8 percent. Equifax found that there were more than 326,300 new loans originated for borrowers with low credit, a year-over-year increase of 9.5 percent. In that same time, the total balance of new loans was $54.7 billion, an increase of 15.6 percent. Of all new first mort - gages, 4.7 percent were issued to low-credit borrowers. The total number of new home equity installment loans originated in Q 4 was 689,400, an increase of 4.5 percent from the year prior. The total balance of new loans in that same time was almost $23 bil - lion, an increase of 3.5 percent. According to Equifax, there were more than 71,000 new loans origi- nated for borrowers with below- average credit, a year-over-year increase of 2.7 percent. In that same time, the total balance of new loans was $1.54 billion, an increase of 7 percent. Of all new home equity installment loans, 10.3 percent were issued to low-credit borrowers, a slight decrease from the previous year's share (10.5 percent). In terms of home equity install - ments, "total origination numbers are increasing slightly, but they aren't matching the payoff rates," said Amy Crews Cutts, Chief Economist at Equifax. She added that home equity installment loans tend to be more appropriate for borrowers with low credit scores. The total number of new revolving HELOCs originated in Q 4 was 1.2 million, up 4.6 percent from a year ago. The total balance of new loans in that same time was $132.6 billion, which was an increase of 9.1 percent. Equifax reported that there were 17,800 new HELOCs originated for borrowers with low credit, a year-over-year increase of 5.6 percent. In that same time, the total balance of new loans was $706.2 million, an increase of 16.9 percent. Overall, 1.5 percent of all new HELOCs were issued to low-credit borrowers. It's Only Uphill for Down Payment Programs Misperceptions about how much homebuyers are required to put down are keeping homeownership programs from reaching their full potential. 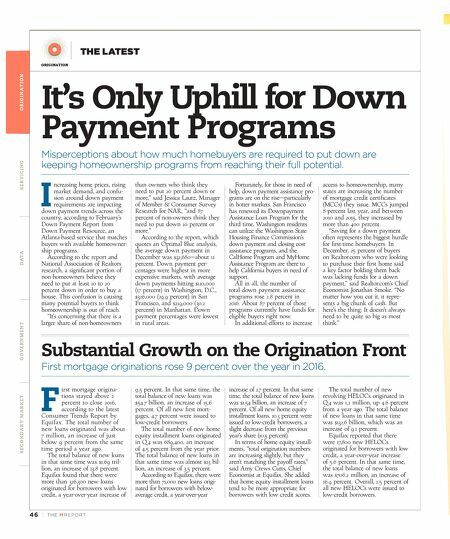 I ncreasing home prices, rising market demand, and confu- sion around down payment requirements are impacting down payment trends across the country, according to February's Down Payment Report from Down Payment Resource, an Atlanta-based service that matches buyers with available homeowner - ship programs. According to the report and National Association of Realtors research, a significant portion of non-homeowners believe they need to put at least 10 to 20 percent down in order to buy a house. This confusion is causing many potential buyers to think homeownership is out of reach. "It's concerning that there is a larger share of non-homeowners than owners who think they need to put 20 percent down or more," said Jessica Lautz, Manager of Member & Consumer Survey Research for NAR, "and 87 percent of non-owners think they need to put down 10 percent or more." According to the report, which quotes an Optimal Blue analysis, the average down payment in December was $32,680—about 11 percent. Down payment per - centages were highest in more expensive markets, with average down payments hitting $110,000 (17 percent) in Washington, D.C., $326,000 (29.9 percent) in San Francisco, and $219,000 (30.2 percent) in Manhattan. Down payment percentages were lowest in rural areas. Fortunately, for those in need of help, down payment assistance pro - grams are on the rise—particularly in hotter markets. San Francisco has renewed its Downpayment Assistance Loan Program for the third time, Washington residents can utilize the Washington State Housing Finance Commission's down payment and closing cost assistance programs, and the CalHome Program and MyHome Assistance Program are there to help California buyers in need of support. All in all, the number of total down payment assistance programs rose 2.8 percent in 2016. About 87 percent of those programs currently have funds for eligible buyers right now. In additional efforts to increase access to homeownership, many states are increasing the number of mortgage credit certificates (MCCs) they issue. MCCs jumped 8-percent last year, and between 2010 and 2015, they increased by more than 400 percent. "Saving for a down payment often represents the biggest hurdle for first-time homebuyers. In December, 25 percent of buyers on Realtor.com who were looking to purchase their first home said a key factor holding them back was lacking funds for a down payment," said Realtor.com's Chief Economist Jonathan Smoke. "No matter how you cut it, it repre - sents a big chunk of cash. But here's the thing: It doesn't always need to be quite so big as most think."